There are several artists with this name: 1) Ultra (also recording as Rider) is also an English pop band, which was most successful in the late 1990s. 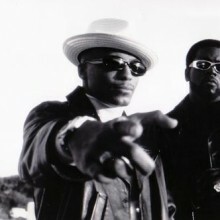 2) Ultra is a hip-hop superduo consisting of NYC rappers Kool Keith and Tim Dog. 3) Experimental/noise US outfit Ultra (R. Stanford King, Wesley Mark, Jon Carlson), who creates deeply anxious collages of sound and voice in a mixture of fear and beauty. 1) Ultra (also recording as Rider) is also an English pop band, which was most successful in the late 1990s. 2) Ultra is a hip-hop superduo consisting of NYC rappers Kool Keith and Tim Dog. 3) Experimental/noise US outfit Ultra (R. Stanford King, Wesley Mark, Jon Carlson), who creates deeply anxious collages of sound and voice in a mixture of fear and beauty. There are some places where they scream their faces off, but mostly it is the nature of the sounds themselves: hordes of insects, demonic sighs, electric buzzes, rumbles, creaking that gets under your skin and into your head, whether you want it to or not. 4) Ultra was a Hard Rock band from San Antonio, Texas from the mid- to late-1970s. Their sound was a mixture of heavy Southern blues rock, psychedelic rock, and proto-metal. The members were: Galen Niles (guitar), Larry McGuffin (guitar), Don Evans (vocals), Scott Stephens (bass), and Tom Schleuning (drums). All of the songs were written by Niles, McGuffin & Evans. Their recordings were compiled two decades later into the album "Ultra" by Monster Records in Texas. 5) Ultra was a synth-pop band from Latvia that existed around the late 1990s, conceived as one more Latvian-language version of the locally wildly popular Depeche Mode. Obviously taking their name from that group's 1997 album Ultra. 6) Ultra was an alias of Michael Phadt & Ullrich Brenner, who released three trance singles under the name from 2000-2001, "Free", "Let Freedom Reign", and "Lost in Time and Space"
Respected readers if you are reading this, you clicked on the page of the recording artist ultra in our eLyricsWorld. Our database has disposal of information about 52389 artists worldwide as well as 829824 songs 30 of which are from ultra. Except for the singer's biography, on this page you can see short piece of information about them, covers date of birth, style, label Be versed in all the news around ultra by adding RSS link. If you prefer you could directly visit the address you are on currently and look through what's new and latest songs about the singer.